Mr. Local is an upcoming film that has Sivakarthikeyan in the lead role alongside Nayanthara. This is the 13th film of Sivakarthikeyan's career. The film is directed by Rajesh M of Siva Manasula Sakthi, Boss Engira Baskaran, and Oru Kal Oru Kannadi fame, and produced by KE Gnanavel Raja under the banner Studio Green Productions. The latest update about the project is that actress Radhika Sarathkumar has finished dubbing for her portions in the film. 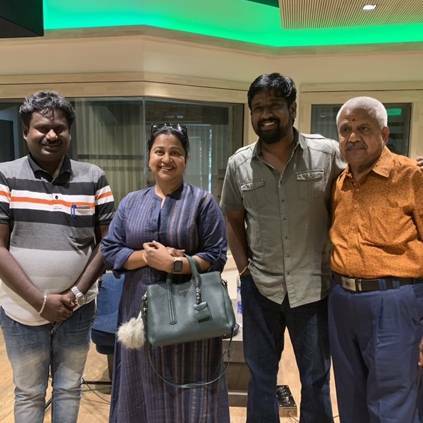 She took to Twitter to announce this: "Finished my dubbing for #MrLocal Thks @rajeshmdirector was a fun ride looking forward to a successful film @Siva_Kartikeyan and gorgeous #nayantara"
Mr. Local has music by Hiphop Tamizha, editing by Vivek Harshan, and cinematography by Dinesh Krishnan B. The movie sees Sivakarthikeyan star opposite Nayanthara for the second time after Mohan Raja's Velaikaran. It is all set for a release on May 1. After Mr. Local, Sivakarthikeyan will be seen in a film with Ravikumar of Indru Netru Naalai fame, and another with PS Mithran, titled Hero. People looking for online information on Mr. Local, Nayanthara, Radhika Sarathkumar, Rajesh, Sivakarthikeyan will find this news story useful.